Elena Guasch and Laia Guasch, aunt and niece, are the fourth and fifth generations of women of a family with concern to try to cure skin, body and mind with natural products. With great interest to extract the best of nature, the great grandmother Antonia worked with natural ingredients to prepare remedies capable to cure different kind of ills. With few tools and a great knowledge of the virtues of medicinal plants and herbs, exercised the profession of “remeiera” from her house in Agramunt. (Remeiera, ancient profession, a person who had knowledge of the virtues of plants and herbs and is dedicated to giving them to cure without being a doctor). Already in the 19th century, the great grandmother Antonia Santacreu was known for her craft of “trementinaire”. The name “trementinaire” is due to the turpentine (trementina in Catalan), which was a popular remedy at that time and with which she worked. While usually trementinaires left to make routes to offer their remedies to residents of the different villages, the great grandmother Antonia offered remedies to those who came to her house; and they came from all over Catalonia to visit her and buy her patches, especially when it was Agramunt’s fair. 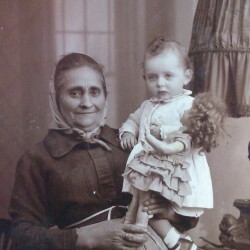 All of the ingredients with which the great grandmother Antonia worked were typical of the Mediterranean area. For example, she prepared the turpentine by extracting the resin of the red pine, purifying it and making it go from solid texture to a texture that is similar to the glue. From here she removed what it was called “black glue”. To do this, she used to work with a rounded earthenware bowl. She added other ingredients to the “black glue” to make a unique turpentine. Once the turpentine was in the right texture, she spread it on special kind of paper and, once cold, it could be applied to the affected area in the form of a patch. According to the active ingredients you added to the patch, these could be used to soothe the pain, chest pain, shock, inflammation, itching or wounds, among others. All herbs that she used were picked up by her, since it was she who better knew the optimum moment of each plant. One of the ingredients with which great grandmother Antonia liked to work was St. John’s Wort. Also known as Hypericum perforatum, this plant houses a precious essential oil in small glands or vacuoles that can be seen, for example, if we look at one of its leaves against the light, we’ll see small holes (hence the perforatum) with the essential oil. It is a plant surrounded by magic and beliefs, and takes its name because it is at the night of Saint John when its essential oil is in its optimum quality and properties. While in the Middle Ages it was believed that it was able to chase away the evil spirits, the great grandmother Antonia appreciated its properties as a topical skin regenerating, healing, anti-inflammatory and antiseptic, apart from being very useful for hits and trauma. She always said: “who owns St John’s Wort oil, does not need a doctor”. But St. John’s Wort also has relaxing properties and stimulates a good mood, so that its properties even went much further. One of her most treasured patches was precisely that of St. John’s Wort, which cost 7 “pesetas” and she applied to the afflicted and discouraged people. 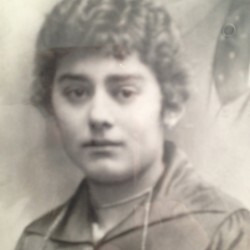 The great grandmother Antonia passed all her knowledge on the application of the natural active ingredients in the health and wellbeing of people, to his daughter Maria. The grandmother Maria, helped her mom from her very childhood to prepare homeopathic remedies and patches. Grandma Maria was willing to keep the activity as a “trementinaire” and to continue developing curative, balsamic patches for those seeking natural remedies for everyday problems. Working with the same utensils and ingredients that her mother, Grandma Maria felt a new concern with respect to the well-being and health apart from the trusted patches. And she began to give importance to food and nutrition. 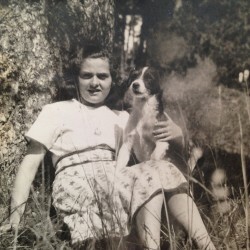 Along with her husband, Grandmother Maria moved from her native village Agramunt to Barcelona, where she opened her own bakery in the Ronda de Sant Pere. Those were times of Civil War but she remained firm producing white bread and black bread every day. She was certainly an advanced woman ahead of her time; Maria began to dump the knowledge of the use of the natural active ingredients in the world of nutrition and she began to prepare her own recipes. Those recipes, in addition to providing nutrients and quench appetite, could promote intestinal well-being, could improve a bad cold or could cure an urinary infection. Thus, it was Grandma Maria who began to understand the body as a whole cosmos in balance, that it not only could be healed from the outside with patches but also from the inside with suitable food to every need. And from the Grandmother Maria to Tona, her daughter. Free soul, hardworking, dreamy and intelligent, a woman ahead of her time. Tona did not follow the trade of trementinaire nor did she enter the nutrition. She married and went to live to Lleida, where she became an entrepreneur and trader of the textile sector, even though her mind also worked in another direction: to cultivate her soul. Being a woman out of the running, she believed in the importance of a balanced mind and a worked soul. Tireless reader, she felt passion for culture and dance. She liked to explore cultures and travelled throughout Europe, Indonesia, Japan, United States, Argentina and Singapore, among others. She had a tolerant attitude and an open mind. So, without knowing it, she completed the cycle: SKIN, BODY and SOUL. Thanks to the knowledge, the experience and the desire to fully live of these three women who have preceded: Elena, Tona’s daughter, and Laia, Tona’s granddaughter, have decided to put together their entire life experience to create Mood Natural Barcelona. With their training, vision and knowledge, Elena and Laia have added science, technology and innovation to the legacy of Antonia, Maria and Tona to build a new way of making health and Wellness without forgetting their Mediterranean roots and their family tradition. It is not a coincidence, then, that Mood Natural Barcelona has integrated the welfare of the maintenance of a healthy body and the exercise of the soul using technology and innovation of XVI century .